What is really up with Bart Blatstein’s Atlantic City properties? Arteriors, an Atlantic City installastion that transforms empty or transitional spaces, has taken over an empty space off the lobby of Bart Blatstein's Showboat, which has an odd identity on the Boardwalk that just might be working. Artist Belinda Manning, above, with her work entitled "Whitewash." ATLANTIC CITY — For years, ARTeriors has been locating its twice-yearly edgy art installations in empty Atlantic City buildings in sometimes sketchy parts of town. This year, it chose Showboat. Was this some kind of shade-thowing toward Bart Blatstein’s enigmatic, not-quite-a-concept hotel, the by-default standout of an otherwise moribund investment portfolio in Atlantic City? Was this a punchline about the former Mardi Gras-themed casino Blatstein purchased in 2016 for $23 million and reopened with a curtain of Atlantic City postcard images strung across the property to block off the empty casino floor? But ARTeriors, open weekends through April, and Blatstein, commuting back and forth from Philly, may be onto something. Showboat Hotel visible in this aerial photo looking south over Atlantic City, NJ on August 10, 2018. For starters, Blatstein will never follow the likes of Denver investor Bruce Deifik, who blew through $70 million of his personal fortune to reopen the old Revel and was hounded back to Denver by hedge funds. Showboat, with an assortment of Vegan meets Horror-Con meets Mid-Atlantic BBQ meets Boxing events, an empty but still recognizable casino floor for convention space, and a low bar for entry, is so far pulling its own weird weight. “My world is at Showboat,” he says. No wonder: Blatstein’s other investments in Atlantic City are dismal, including the Pier at Caesars, where he ballyhooed a transformation to the “Playground," and “T Street,” not to mention the never-realized Bart Bowl concept. A man sits in adirondack chairs that are for visitors on the south facing side of the Playground in Atlantic City on April 4, 2019. Outside of popular third-floor restaurants (including Buddakan and Continental), and the picturesque wedding venue One Atlantic, the Playground is now a ghost mall, abandoned by Apple, Tiffany’s, and 50 other stores, anchored by “It’s Sugar,” a place where Victoria, Tommy, and Willie (Secret, Bahama, and Wet) are the only ones left to play. A woman walking on the 2nd floor, of the Playground in Atlantic City, stops to look at a map of restaurants and shops that are still open for business there on April 4, 2019. Blatstein’s takeover of Garden Pier has done little more than evict the city’s art and history museums, though he told casino regulators last month he’s seeking environmental permits to build out the pier to 600 feet. He is also sitting on several parcels in the Inlet. He’s bullish on the Boat, as he calls it. He views the sprawling property like a mini-Northern Liberties, the neighborhood he famously jump-started: a place with near-forgotten charm waiting for, well, pretty much anything. At Bart Blatsteinâ€™s Showboat, the former casino floor is now used for conventions. “We’re killing it with events,” he said in a telephone interview driving home from Atlantic City. Recently approved to pursue a casino license, Blatstein says he plans to build a gaming and sports betting facility on the sand lot adjacent to Showboat. He’s planning to transform one of Showboat’s towers into apartments. At Showboat, Blatstein has gathered in everyone from the itinerant ARTeriors; the BBQ’ers; and, perhaps fittingly for a place reviewers still noted for a “Shining vibe," the New Jersey Horror Con and Film Festival. (“If you’re an abandoned sites aficionado, stay here, but don’t expect to make it up the public elevator in one piece, or to have a trash can in your room/bathroom,” noted Justin K. of Houston in a January Yelp review). ARTeriors jumped at the chance for the space, enough for seven artists, an oddly shaped room filled with the ruins of the old Showboat, which closed in 2014, including chandeliers that quickly were claimed for their art. 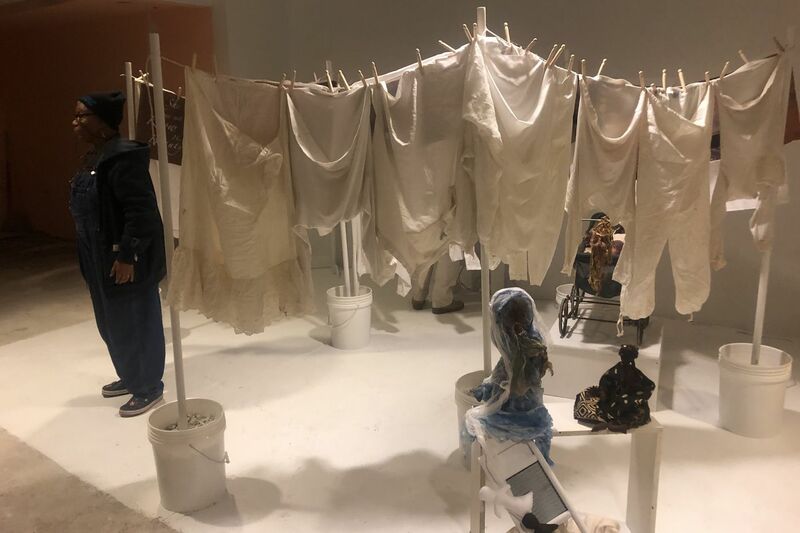 Belinda Manning’s powerful installation, titled Whitewash, focuses on Brown v. Board of Education, and psychological testing done with children using dolls of different races. Another, Billy Joe Michel, re-created the trailer of her youth inside that forgotten Showboat storage area. @lennox_warner cooking up something special for ARTeriors this Friday March 15 at the @showboat_hotel ! “It felt like it went with the vision for us," Kazten said. “This property, this room, this whole idea is in transition." Arteriors, an Atlantic City installastion that transforms empty or transitional spaces, has taken over an empty space off the lobby of Bart Blatstein's Showboat, which has an odd identity on the Boardwalk that just might be working. Blatstein is equally bullish on the Showboat, where he’s opened a 24-hour state-of-the-art gym called Matrixx in the space where they used to store linens. He says Showboat in the next 16 months has 85 events booked and ready to roll right through those big roll-up doors that allow easy access and unloading. Let the good times roll up! The old high-end slots parlor is being retrofitted to be a boutique venue for boxing, which has popped up at Showboat at the old House of Blues and on the casino floor. A recent fight event in the parlor drew a packed, high-energy crowd. A recent event in a former high end slot parlor at Showboat. A map of restaurants and shops that are still open for business in the Playground in Atlantic City on April 4, 2019. Blatstein owns the mall that sits atop a pier itself owned by Caesars, which is facing financial uncertainty. Caesars originated the high-end concept at the Pier, but lost interest in recent years. Store owners complained Caesars did not offer comps that sent customers to the Pier, and parking has always been a problem. The Playground seems destined for a buyer, perhaps one who can take advantage of tax breaks through the state’s opportunity zone. Plenty of retail space available at the Playground in Atlantic City on April 4, 2019. Meanwhile, Showboat, a profitable and loved casino before Caesars shut it down, is finding its way. This summer, Matrixx membership includes access to Showboat’s outdoor pool. Surf Bar will put out comfy chairs on the Boardwalk, the Epic Comic Con-ers and the vegans will arrive. If nothing else, it’s an easy setup, if also an easy punchline.